It's time to start searching for that special Father's Day gift. There is no better place to start your search and end your search than at Woodstock Candy. The Chantilly Lane Singing Grandpa Bear is perfect for any dad or grandpa. It will sing you a beautiful tune called "When I'm 64." Not only can you hear them sing but you can watch them sing as they sway to the music and mouth the words. Each Chantilly Lane Singing Grandpa Bear is unique in their own way. We are proud to offer six different bears each wearing a nifty shirt, bow-tie and hat. Each bear come with their own unique saying printed across their shirt. All of these sayings perfectly describe men to their best (with a little humor)! The Chantilly Lane Singing Grandpa Bear make great Father's Day gifts or even birthday gifts. Your dad/grandpa will surely appreciate this little bear as it will make him feel right at home with himself! Who ever said you had to grow up!? Here at Woodstock Candy, we want you to be a kid for as long as possible. With the 30th Birthday Gag Gift, you can stay a kid for just a little bit longer! This is a one of a kind birthday gift that should be given to all 30 year olds. They won't hardly be able to stand themselves as they begin to reminisce about the good ol' days. Some of the fun gifts that are included in the 30th Birthday Gag Gift are items like: Magic Cube, Silly Putty, Diva Sunglasses, Yo Yo and so much more. These toys may seem silly to you as you read them, but in reality once you have these toys in your hands again, you will have a very difficult time putting them down. turning 30 is a landmark birthday but there isn't any reason you can't still have fun. So let your friend or family member turn 30 this year with some fun. Take them down memory lane with the 30th Birthday Gag Gift, they'll love it! 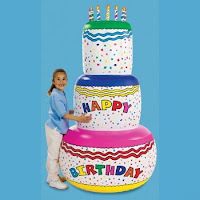 Celebrate your happy day with this amazing Jumbo Inflatable Birthday Cake Decoration! When inflated, it reaches the height of 6 feet tall! This magnificent cake makes a very impressive centerpiece for any party. Just set it on the floor, and see how everyone admires it with their oohs and ahhs! The inflatable three-tiered cake is appropriate for both young and old; no matter what age, who wouldn't love to have this gigantic monument as a symbol of their birthday? Kids will go crazy for this, and will be talking about the cake for a long time. It's also a perfect idea for any milestone celebration such as 50th or 60th birthday, or an "Over the Hill" bash. 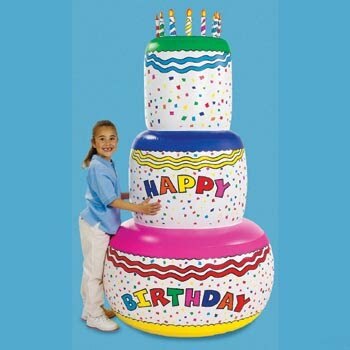 Showcasing this inflatable giant decoration is a sure way to make any party memorable. Besides having this in your home for a birthday party, it's also great for work or school. The last thing someone would expect would be to walk in to a room and see a 6 foot towering inflatable cake in front of them! This party accessory can be used over and over to celebrate all of your friend's birthdays. Just inflate with a bicycle pump or small hand held compressor for a quick set up. The next time you're celebrating a birthday, don't forget the cake! Did you know that a Hair Hat Visor can instantly change the way you look? Get ready for a lot of laughs with this silly concept, because when you have one on, you will look radically different to those people who know you. Wait till you see the look on your family's face when they catch a glimpse of you in your new hair! For a fun joke, wear this to work or school. People can't help but laugh when they see you looking such a far cry from yesterday; all from a simple hat! This is conveniently all one piece, all you have to do is put it on your head, just like you would with any other hat. 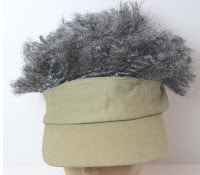 The Afro Hair Visor is perfect for someone with very short hair; so that when you wear it, the only hair you see is the wig part sticking out from the top. It's hilarious because people can't tell if it's real or not- they will do a double take! This is not supposed to mimic some high priced wig; it is an idea thought up by someone with a great sense of humor. The hair hat visor isn't expensive like hair pieces or wigs. It's just a regular visor with a silly hair do that will make you look totally different. Maybe you're having a bad hair day, or you just want a new look for the time being. Instantly you will be transformed into the new you! If you don't feel like drawing attention to yourself, this is probably not for you. This makes a great gag gift for the person who is hard to shop for. You can be assured that most people, men and women, young and old, would love one of these. A hat collection isn't complete until you have a Hair Hat Visor! FREE Candy for Your Candy Memories! We're offering a 10 piece bag of FREE nostalgic candy for your memories! If you'd like to share your nostalgic memories of the candy you grew up with, we'd love to hear about them. We want to add your stories to our website so that other people can enjoy what you have to say about the candy you ate when you were growing up. 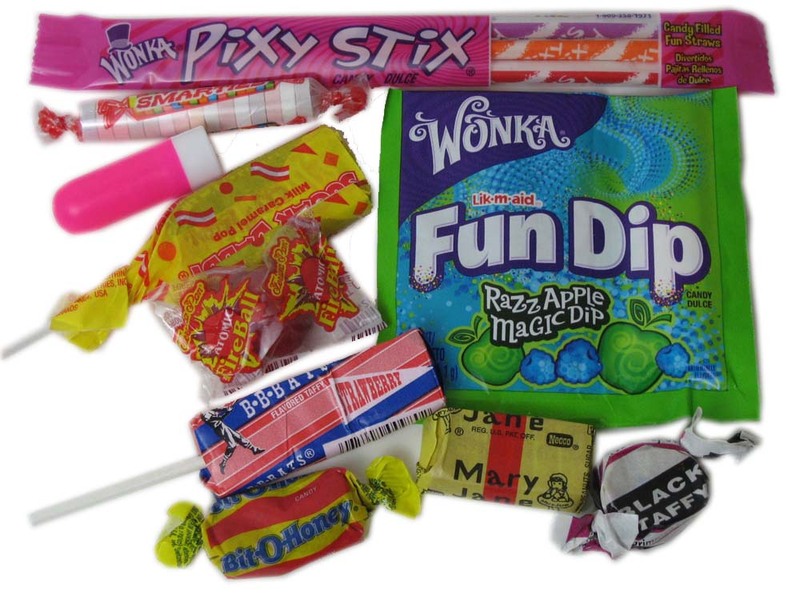 In return for your submissions, we will send you a FREE 10 piece bag of retro candy! 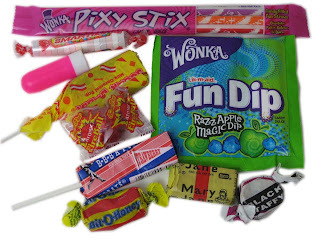 A lot of candy is regional, so some people remember candy that was popular in their part of the country, while other people didn't have it available in their penny candy stores. Some candies are out of production, and are only memories now. Other candies have been forgotten about, but wouldn't it be great to read about what others have to say about this fun part of childhood memories? Don't worry about your writing skills; readers are just interested in your nostalgic memories. It will be fun to read about childhood candy from different parts of the county. So, sit back and relax, think back to when you were a kid, and remember those endless summer days when you would ride your bike to the penny candy store. Share your memories here!